Disney Guilty Party was released on August 31, 2010 for the Nintendo Wii with a MSRP of $39.99. The game was developed by Wideload Games, and published by Disney Interactive Studios. A portion of the game's description says, "Disney Guilty Party is a fun and hilarious mystery party game, exclusively for Wii™ console. Friends and family play as the savvy sleuths of the world-famous Dickens Detective Agency to investigate a series of mysteries and identify the guilty party." How many hours have Wii owners spent investigating the series of mysteries, in the 154 days since Disney Guilty Party released? Let's take a look! Disney Guilty Party has 7,614 Wii owners reporting their game-play data through the Wii's Nintendo Channel, for its "hours" debut. Disney Guilty Party has 51,536 Total Hours of game-play reported on its debut, with an average "investigation" time of 6 Hours 46 Minutes "Per person"(or console) reporting data. 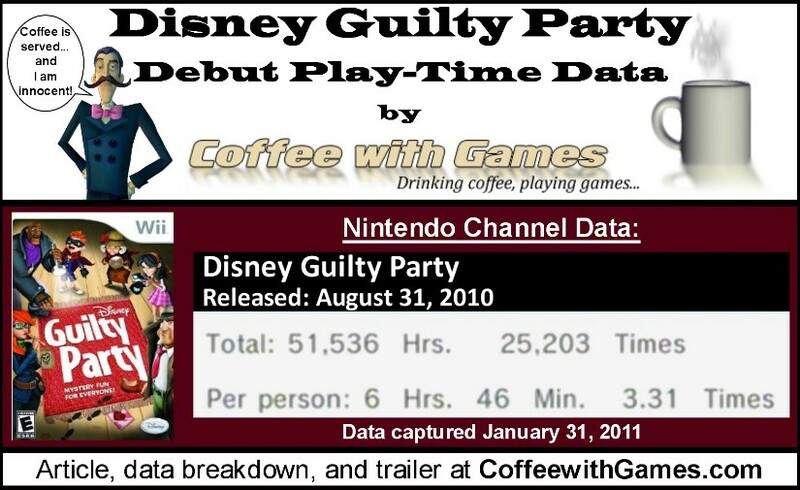 Disney Guilty Party's average play-time per session is just over 2 Hours 2 Minutes. Disney Guilty Party's Amazon.com sale rank is #329, and it is currently selling for $27.99. Disney Guilty Party's "professional" review score average is 78.71%, based on 14 reviews on GameRankings.com. Disney Guilty Party has a 4 out of 5 Stars rating on Amazon.com, based on 65 customer reviews. When converted to a 100% scale, Disney Guilty Party's customer review score average is 82.76%. Looking at the game's 51,536 "Total Hours" reported, if the Dickens Detective Agency was a real life agency, it would have made between $2,061,440 and $5,153,600 in the 154 days reported; based on the average private investigator fees. I became interested in Disney Guilty Party when I saw the first trailer for it last year. I still haven't played it though, but the game does look like it would be fun; especially as an alternative to the board games Clue and Guess Who . As for the game-play hours, I think seeing Guilty Party debut in just 154 days is really good for this type of game, especially coming from a third party publisher on the Wii. As I mentioned in the "Coffee Beans" section, when Disney Guilty Party released it had a MSRP of $39.99. It appears the game has seen a price drop since it released, as Amazon.com has its list price now at $29.99. Have any of you played Disney Guilty Party? If so, what do you think about it, and is it a game you would recommend to other Wii owners? This is a great game. The actual "campaign" portion of the game is pretty short. It will take you around 4 hours to finish. The best part is doing a random case where every time you boot up the game it will randomize all the possibilities making for a brand new experience every time. The voice acting is well done. The animations are funny. We've posted a review over at Nintendo Okie, but I would recommend this to people. Especially families. I've had the chance to play the game for a bit and it seemed rather nice. The humour was very well done and if the people I was with would've had any interest in the game it could probably have been a funny evening. As Tony above me already said, families can probably have some good times with it. Guess the only thing that might be a turnoff for some is that you have to wait for your turn, on the other hand, that's what you do in board games. Maybe some people are just not used to that in computer or videogames anymore and hence find it boring quickly. Can't say anything about longetivity or replay value, but what Tony said sounds good enough to not have me assume it's so linear that you're done and out once you've finished the campaign. is guilty party a ..... guilty plesure?!? I've been interested in giving this game a go for a Wii party night of sorts. Worth a rental it sounds. Keep up the strap lines Coffee. My wife actually just saw this post today, and asked, "What's Guilty Party?" I told her it was like a board game...in video game fashion, like Clue and Guess Who. She actually thought it sounded interesting. Yea, the random cases sound like they help add to the game's replay value, I guess just like a regular board game which is cool. If I ever end up with it, I'll try to provide some coverage for it as well...but you can check out Tony's review over at Nintendo-Okie.com. "Keep up the strap lines Coffee." Haha! It's always interesting how random things will pop into my head at the last minute with these posts. Thank you all for the comments and feedback! Has anybody else played Guilty Party, and want to share your thoughts on the game...good or bad? Yea you pretty much get a completely new experience every time you play the game. I haven't run into an issue playing a party where the case was the same as one I'd done before. The story itself is very short, but highly entertaining and worth playing through. Some really great and funny lines in the dialogue.